Chances are you do the biceps curl for one main reason: To build a head-turning pair of guns. But if you’re going to have buff upper arms, you should try to match them with complimentary lower arms. That’s where the Zottman curl comes in. “The Zottman curl is one of the best exercises for working your forearms,” says Trevor Thieme, C.S.C.S., Openfit’s senior manager of fitness and nutrition content. In addition to hitting the biceps brachii (the muscles that create the enviable bulge in your upper arm), the Zottman curl also emphasizes the brachioradialis, a key muscle in your forearm. How does one move do all this? Unlike a regular biceps curl, the Zottman curl requires you to flip your grip at the top of the movement, switching from a standard curl to a reverse curl. This is where the move gets its forearm-building power, and how it allows you to really hit two major muscle groups for the price of one exercise. Here’s how to do the Zottman curl with proper form, and how it can take your weight training to the next level. 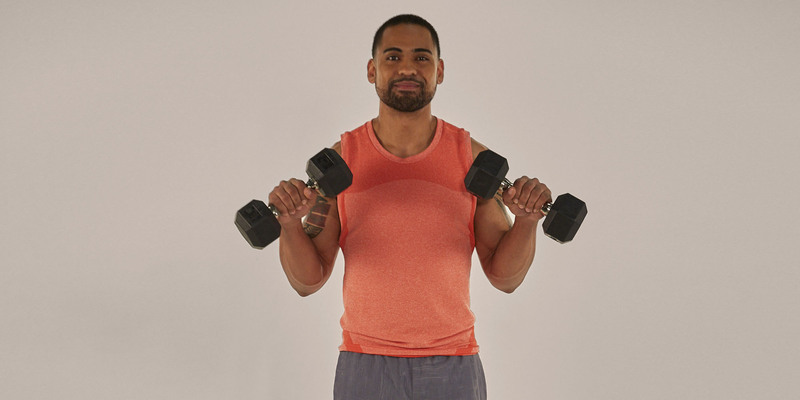 Stand tall holding a dumbbell in each hand at arm’s length by your sides, palms facing forward (underhand grip). Keeping your elbows tucked and locked by your sides, curl the weights toward your shoulders. Flip your grip 180 degrees (to overhand), lower the weights back down to your sides, and then flip your grip again (to underhand) to return to the starting position. To change the difficulty of this move, all you need to do is adjust the amount of weight you use. If you want to make it easier, use lighter weights. If you want to make it harder, use heavier weights. Think of the Zottman curl as a two-for-one special. It gives you all of the upper arm building power of the biceps curl and all of the forearm building power of the reverse curl in a single move. And in this case, all of that building makes you better at lifting. Everything. So whether you’re trying to hoist a couple of bags of groceries with one arm or squeeze out an extra rep of the pull-up with perfect form, you’ll be glad you added the Zottman curl to your routine. What Muscles Does the Zottman Curl Work? While the biceps curl focuses your biceps brachii and the reverse curl focuses on your brachioradialis, the Zottman curl focuses on both. Your biceps brachii are located on the front of the upper arm. It has two heads – one long and one short – that work together to flex the arm at the elbow. Your biceps also help you rotate your forearm outward. Located below the biceps is the brachialis muscle. It’s also responsible for curling your arm up, and it adds shape and definition to your upper arms. While this muscle is smaller than the biceps brachii, it’s actually the more powerful of the two when it comes to elbow flexion thanks to its proximity to the elbow. As for the forearm, the main muscle here is the brachioradialis, which runs from the bottom of your upper arm to the bottom of your forearm. It’s primary function is elbow flexion, just like every other muscle targeted by any type of curl (including the Zottman curl). But it also helps with supination and pronation, rotating the forearm inward and outward.